The Yugoslavia war crimes court’s sentencing of six wartime Bosnian Croat officials has special significance for Mostar. Sarajevo, Bosnia & Herzegovina – For over 400 years the Old Bridge in Mostar united the east and west of the city. 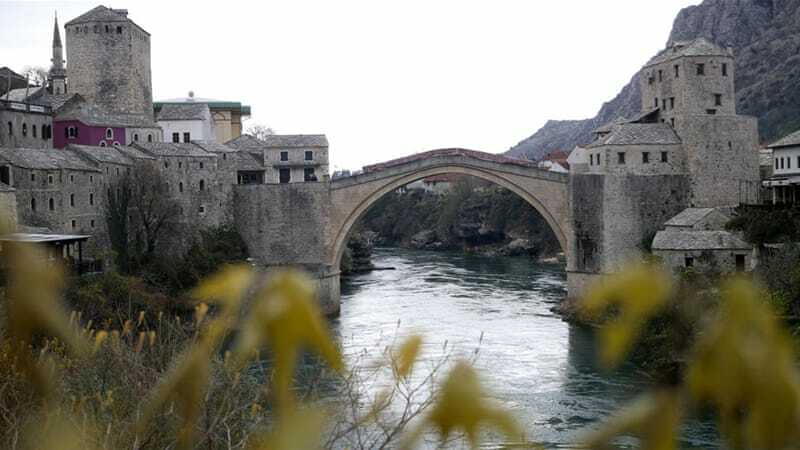 The bridge has always been the symbol of the Herzegova region’s Mostar, the most multi-ethnic city in former Yugoslavia. On Wednesday the appeals chamber at the UN’s International Criminal Tribunal for former Yugoslavia (ICTY) in The Hague upheld its first-instance verdict and sentenced six former Bosnian Croat military and political officials to 111 years in prison. The tribunal upheld the verdict from 2013 that the six Bosnian Croat officials along with the late Croatian President Franjo Tudjman, formed the Croatian “joint criminal enterprise” (JCE), which aimed for a “unification of the Croatian people” and ethnically cleansed the Muslim population in Bosnia and Herzegovina in order to create a “Greater Croatia”. Croatia’s then-Defence Minister Gojko Susak and former Croatian chief of general staff, Janko Bobetko, also participated in the JCE. The tribunal further confirmed Croatia’s role in the conflict, ruling that Croatia held authority in municipalities in Herzeg-Bosnia by controlling the Bosnian Croat armed forces, the “Croatian Defence Council” (HVO). Croatia held eight municipalities in the statelet “under occupation”. One of the convicted war criminals, Slobodan Praljak, was initially charged with ordering the destruction of the Mostar Old Bridge, which judges in the first trial said: “caused disproportionate damage to the Muslim civilian population”. This time, however, the appeals chamber accepted part of Praljak’s appeal, stating that the bridge had been a legitimate military target during the conflict. The Old Bridge, built by the Ottomans in the 16th century, is one of Bosnia and Herzegovina’s most recognisable landmarks and is considered one of the most exemplary pieces of Islamic architecture in the Balkans. “I was shocked when the Old Bridge was destroyed, and now I went through shock again when the representatives of an international court accepted this from the HVO, from the people convicted that the bridge was of military character, that it was used as a crossing for soldiers, transferring of munitions, etc,” Balic said. “All of the bridges were destroyed in Mostar at that time, all of them. “Only the Old Bridge was left standing. I remember it well … The bridge was used to transfer patients from the right bank of the Neretva to the left. Upon hearing that his 20-year sentence had been upheld, General Praljak shouted at the presiding judge “I, Slobodan Praljak, reject the verdict. I’m not a war criminal”, and then drank poison out of a tiny bottle. Praljak died shortly after in the hospital. Eugen Jakovcic, of the Croatian Documenta (centre for dealing with the past), told Al Jazeera that Praljak’s “insane” act “strengthens the mythology which undeniable crimes were built on”. “Praljak’s act contributes to the continuation of that Balkan tradition … this heroism which isn’t founded on logic, facts, but on irrationality. Crimes were committed based on this mythology. We all know how that whole Serbian moment started off; it was full of mythology,” Jakovcic said. 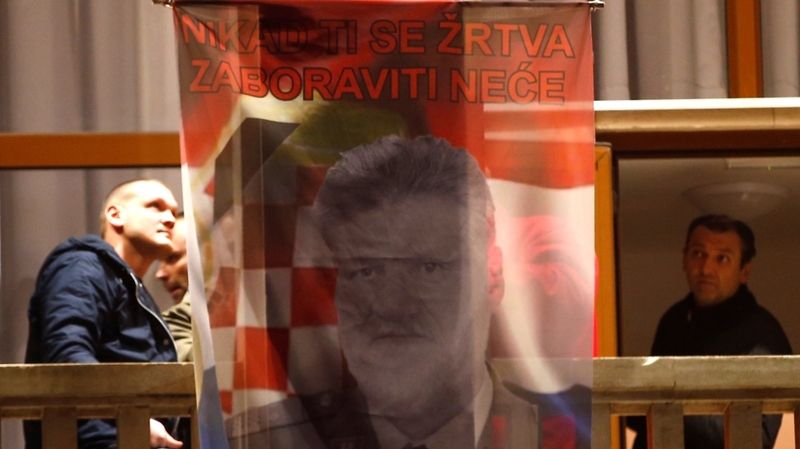 Following the verdict, Andrej Plenkovic, Croatia’s prime minister, said the convictions were a “moral injustice” and that Praljak acted in a way “that he thought was best for his people”. Despite the ICTY’s findings, President Kolinda Grabar-Kitarovic denied Croatia’s involvement in the Bosnian war. “Croatia did not attack anyone,” Grabar-Kitarovic said on Thursday. The idea of a Herzeg-Bosnia statelet lives on in many cities in Bosnia and Herzegovina. In many areas of Herzegovina, Croatian flags and the similar coat of arms of Herzeg-Bosnia decorate the streets that feature names such as “Republic of Croatia”. In the Bosnian-Croat Federation entity, there are more than 30 schools that operate under the principle of “two schools under one roof”. Segregation also applies to some hospitals and seniors’ homes. There are also two post offices, two telephone companies and two electrical companies – one for Croats, the other for Bosniaks in many cantons. Mostar’s Old Bridge was officially rebuilt in 2004, but the city remains deeply divided between a Bosniak side on the east and a Croatian side on the western bank of the Neretva river. “It’s a divided city, but it’s not due to the people. I frequent both the left and the right side; I drink coffee here and there. It’s the youth that need to come to power,” Balic said, referring to the politicians who fuel division. “A lot of people from Mostar were killed [defending their city] – 23 jumpers from my [jumping and diving] club,” Balic said. “They were of all nationalities – Serbs, Croats, Muslims. We didn’t divide ourselves by nationality.